Levenger is always a great place to window shop, especially their Circa notebooks. Another category that's a favorite is their own brand of pens, in particular the True Writer series. 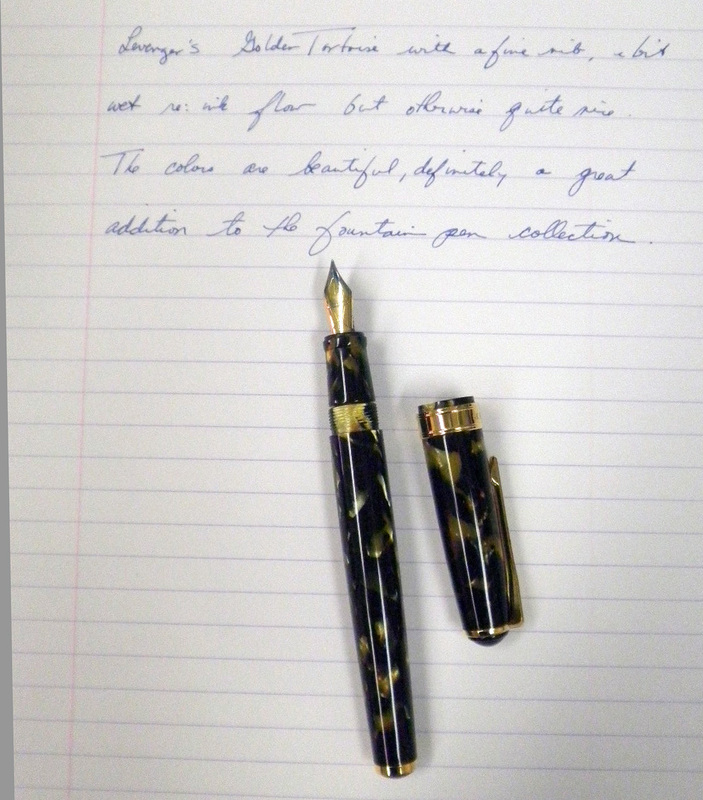 Currently on of their most beautiful True Writer pens is on sale, the Golden Tortoise collection, and so I've added one (or two, actually) to my collection. This is one of the best faux tortoise shell designs I've ever seen, it looks very much like an organic material rather than resin. The golden quality gives it a beautiful luster, as do the gold clip and band. And the jewels on the cap and barrel give the fountain pen a very nice tapered effect that does give the illusion of a slimmer pen. There are three nib choices and I went with the fine. It's a broad fine point, more in the fine with a touch of medium to it, and writes very smoothly if a bit on the wet side (although I've learned my lesson on that score, I just had a nib re-ground and it's so dry I've been gently manipulating the tines to try and get more ink flow). I have to say I'm impressed by the True Writer converters, which are larger and hold a bit more ink than some of the others I use. I've gotten to like the True Writer fountain pens (Kyoto will be reviewed next), so if you are thinking of getting one definitely look at the Golden Tortoise. It's beautiful, makes an impressive statement, and is on sale--what more inducement do you need?